With this installment I would like to talk a little about overflowing SU carburetors. Have you an MG that requires a knock on the float camber with a screwdriver handle from time to time to stop the flooding? This is a common occurrence and several potential areas that can cause this. Certainly worn needle and seats and a leaking float are 2 causes. Another is the maladjustment of the float level and the lever fork. Float level is critical to the smooth and accurate running of any carbureted engine. So critical in an SU that it should be the very first thing you set or make sure of when trouble shooting an SU problem. An easy way to check this is to remove the dashpot and piston and have a look at the fuel level in the .090" jet hole at the bridge. The fuel pump should have been running briefly to ensure that the chamber is full and the fuel level can then be seen in the jet hole. The bridge is the rectangular surface where the jet can be seen in the carb body. You should see fuel about 1/8" or so below the top of the jet tube when looking at it with the parts removed. Making sure the float is sound and setting the float lever correctly will insure that the level is where it should be. Since the SU carburetor draws fuel from the jet, across the bridge, past the metering needle, via intake vacuum the fuel must be high enough so that it can do that. But, too high and it will be in a constant flooding situation which will make it impossible to set the mixture correctly. The SU float lever is the forked piece that operates the needle and seat valve to control fuel in the chamber. There are a couple if issues with this part. It can wear where it contacts the brass float and it can wear the float. It can wear at the pin and the holes where the pin passes through can wear, although a fair amount of wear at this pivot point is tolerable. 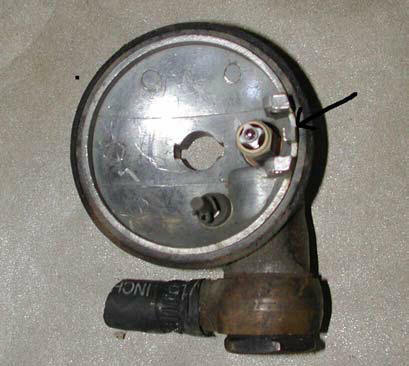 But I think the main issue with the float lever is the fact that it can swing open enough, with a low fuel chamber that a binding situation can occur between the float lever and the bottom of the needle valve when fuel is allowed to fill the chamber. 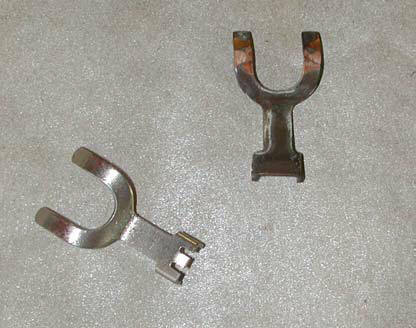 The float lever for the T-series was the first type for the H2 carburetor. In picture #1 you can see the comparison and the early type lacks the slots, which forms the tang for the lower limit adjustment of the float lever. The later float lever with slots can be obtained from Joe Curto or slots can be carefully cut into the old style lever with something like a dremel tool. Correct adjustment of the tang will keep the needle from falling too far and binding. Using a needle nose pliers, slightly bend the tang so that when you lift the forked float lever from the lowest position, you do not feel a bind. This usually amounts to only about 5-10° of adjustment to the lever. The tang should contact the center post (picture #2) between the hinge pin lugs in the lid when the fork is at its lowest position. Also make sure that any correction to the float lever for level adjustment is done at the area where the prongs of the lever just start and not the flat section of the lever. The prongs of the lever should just rest on the adjustment bar as outlined in the service manual. Later Vitron tipped needle and seat assemblies are preferred to the old stainless needles or aftermarket trick parts. Further to float chambers for our cars: There are 2 or 3 different chambers, lids, and several more needle and seats options. It is imperative that you have the correct parts for your engine and carb set-up. Incorrect lids can cause excessive flooding or fuel starvation. The same with needle and seats. Pre-1955 lids will often have tickler pins and sliding loose hinge pins for the float lever rather than the later press fit pins, which are suitable replacements.